Several locations around Kendal are dark enough for good astrophotography, but the one direction that causes problems is south west, where the lights of Morecambe Bay fill the horizon with their orange glow. About an hour’s drive away is the West Cumbria coastline. To the south of St. Bees it runs in a straight line from north west to south east, so it faces south west across the sea to the Isle of Man, Dublin or Anglesey (depending where you stand) with no urban lights to spoil the view. From the car park at the end of the coast lane at Silecroft, the offshore wind farm sits exactly where the Milky Way hits the horizon, so I took the opportunity of clear skies last night to go and take a look. I had expected to find the wind farm illuminated only by starlight, but it was not to be! Conditions were quite windy, so the mount was set up in the lee of the parked car. First, the 50mm lens gives a viewing angle of 27º x 18º. 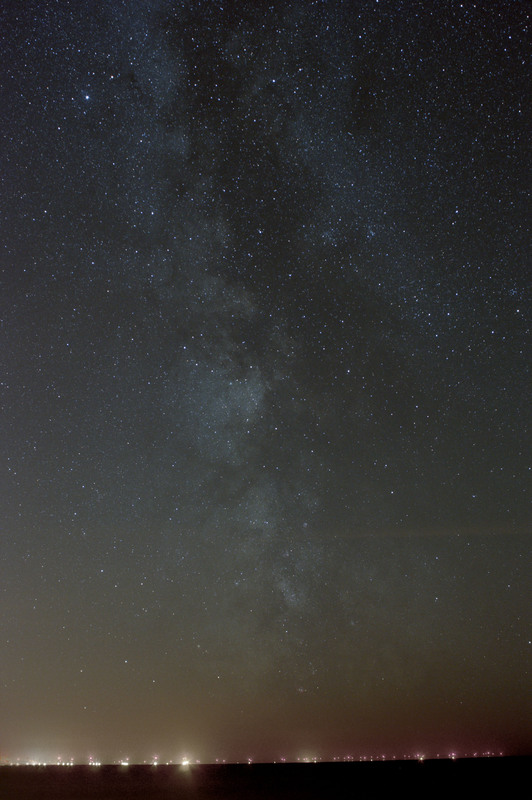 26 August 2014: The Milky Way from Silecroft. 50mm f/4 ISO 800, 100 sec. 10 frames of 10 sec. 50mm f/4 ISO 800, 150 sec. 5 frames of 30 sec. The 24 mm lens widens the angle to 52º x 36º. 24mm f/4 ISO 800, 7min. 7 frames of 60 sec. Moving up from the horizon, the summer triangle of Vega, Deneb and Altair extends almost to the zenith. 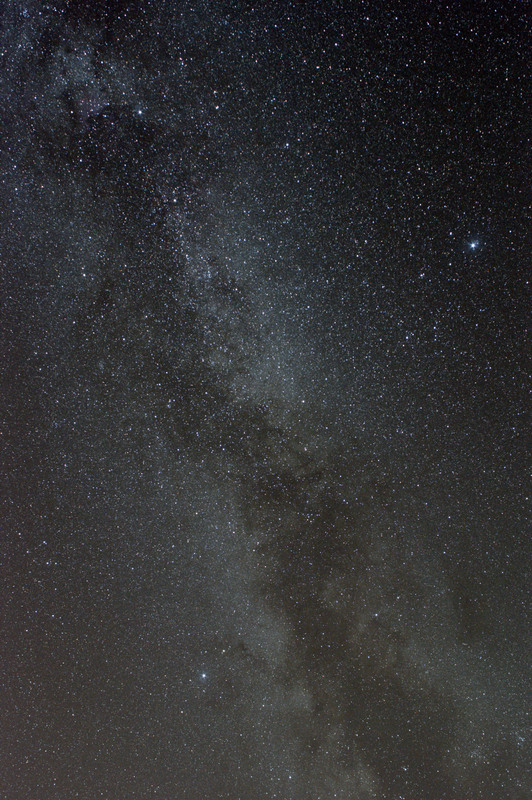 26 August 2014: The Summer Triangle from Silecroft. 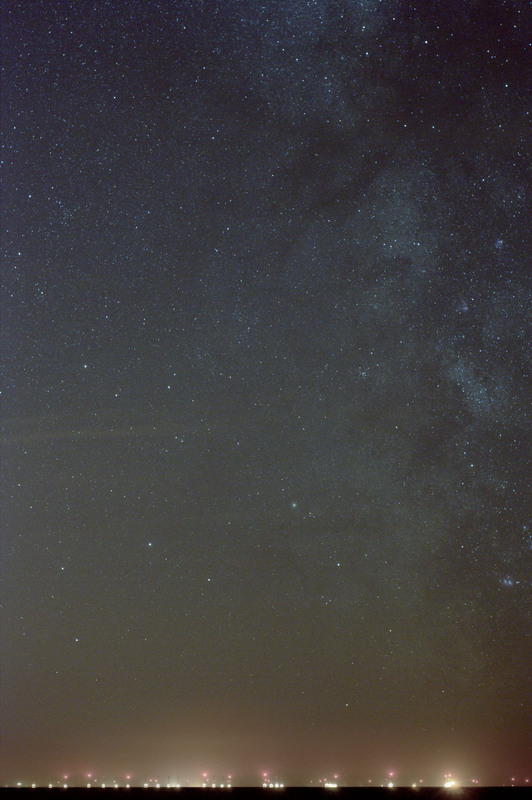 24mm f/4 ISO 800, 6 min. 3 frames of 120 sec. Why not stitch those together? 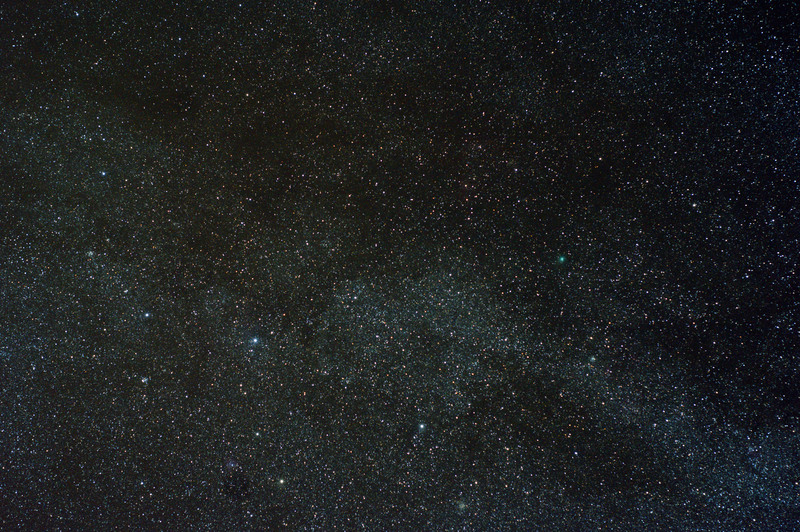 Further up the Milky Way, the 50mm lens again, for Cassiopeia looking down on Comet C/2014 E2 (Jacques). 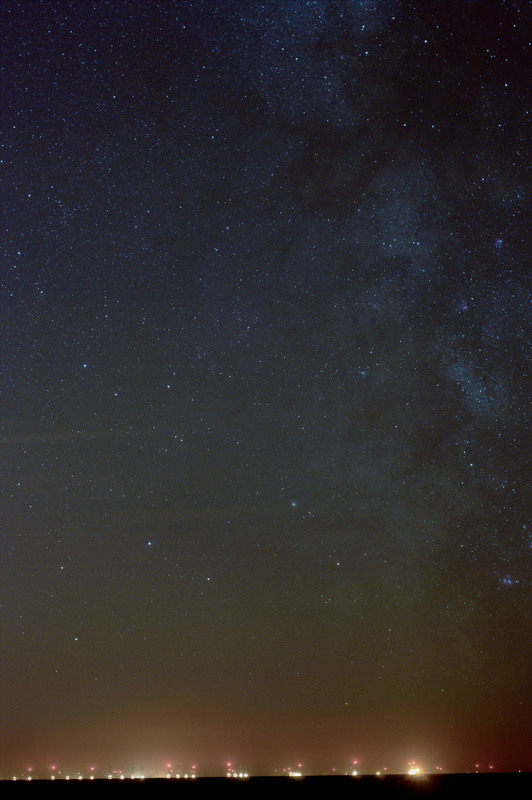 26 August 2014: Cassiopeia and C/2014 E2 (Jacques) from Silecroft. 50mm f/4 ISO 800, 6 min. 3 frames of 120 sec. Wide angle astrophotography is just as rewarding as going for long exposures at high magnification!